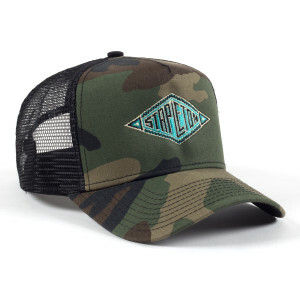 New Era Snapback Camo trucker hat with a Stapleton turquoise southwestern embroidery. The hat fits my big ol’ head, is comfortable, and is high quality. I would expect nothing less from one of country music’s legends. Highly recommended! Arrived on time. Love the hat. I love this hat, goes with everything and I can show my love for Chris Stapleton.